Suitable for guitar and bass. 1. Perfect combination of precision tuner and upscale capo, beautiful and practical. 2. Tuning objects: guitar, bass, Chromatic. 3. Tuning accuracy: +0.5 cent. 4. You can tune your guitar down one or two half-steps. 5. Power supply: 1 x CR2032 button battery (Not included). 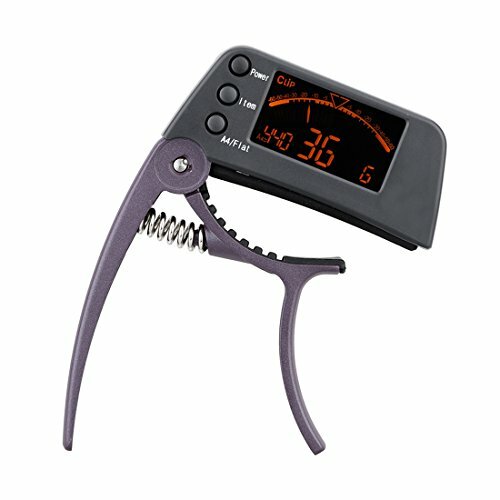 1 x Clip-on tuner with clamp capo for guitar and bass. .Perfect combination of precision tuner and upscale capo, beautiful and practical. .Tuning objects: guitar, bass, Chromatic. .You can tune your guitar down one or two half-steps. If you have any questions about this product by Ray-JrMALL, contact us by completing and submitting the form below. If you are looking for a specif part number, please include it with your message.